Outside my cabin in the Santa Monica Mountains, I pace around the Sycamore tree. It sheds its leaves in the autumn sun and I crackle along beneath it, himming and hawing about pulling the trigger. My heart tells me to go to the bank and pull out my nest egg, my emergency fund, my rainy day cash … and buy a school bus?! Fortunately, Kitty’s on the other end of the phone — and not rational, Depression guy. She reminds me of the night we spent in Phoenix after test driving the bus, and how we were glowing (not just from the margaritas). We were stoked on life. It’s unimaginable we let that shine dissipate in the Arizona sun. But a night spent camping by prisons, shooting ranges and landfills will do that for you. Then there was her birthday, when I went to a vintage outdoor market to find a cool present, something small and travel savvy for the journey ahead. There was nothing remarkable and I headed for the exit, glancing over at one last stand before the parking lot. On a table, encircled by a dozen other vintage toy cars, sat a 1950s-era ride with chipping canary yellow paint. It was a “skoolie” and it screamed out to me. Who knew the Magic Bus could fit in the palm of your hand? “Why did you pick up that toy school bus?” Kitty says, wanting me to ask myself more than answer her. 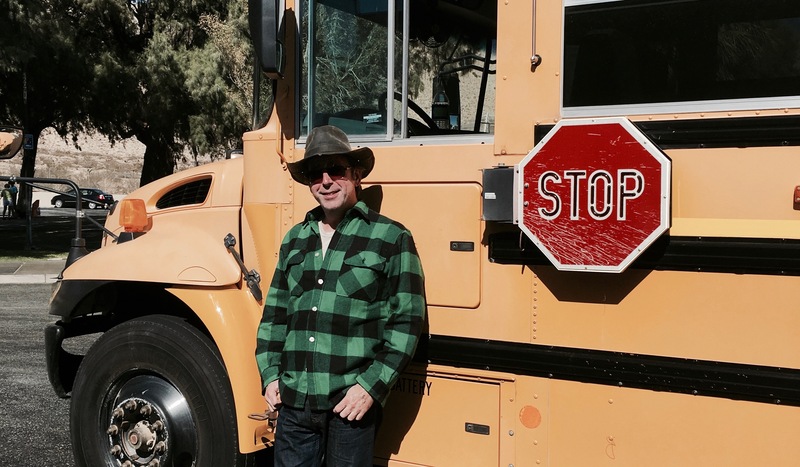 It’s a good point, and crystallizes how my heart seeks the bus we locked eyes on in Arizona. Every day since, while scrolling ebay for vans and shuttle buses and ambulances to convert, I checked to make sure our bus hadn’t sold. It was out there waiting for us. Sometimes Kitty whispers from within my heart or calls out from the reaches of creation. She wants for me what I want for myself, and that ignites my spirit. Standing in fallen leaves at the foot of the Sycamore tree, it’s clear that change is inevitable. Time marches on regardless of whether or not we pull the trigger. Will I regret not standing still or playing it safe one day? This is the rainy day, hard to see for the trees and sunshine. I do know I will absolutely regret the day I hesitated, didn’t cash out and let our school bus ride off without us. I hang up with Kitty, dial the dealer in Phoenix and drop a deposit. That glow returned when I plucked the toy bus from the vintage mart and it’s within me again today. Immediately, it feels as if I’ve reached another gear in life. 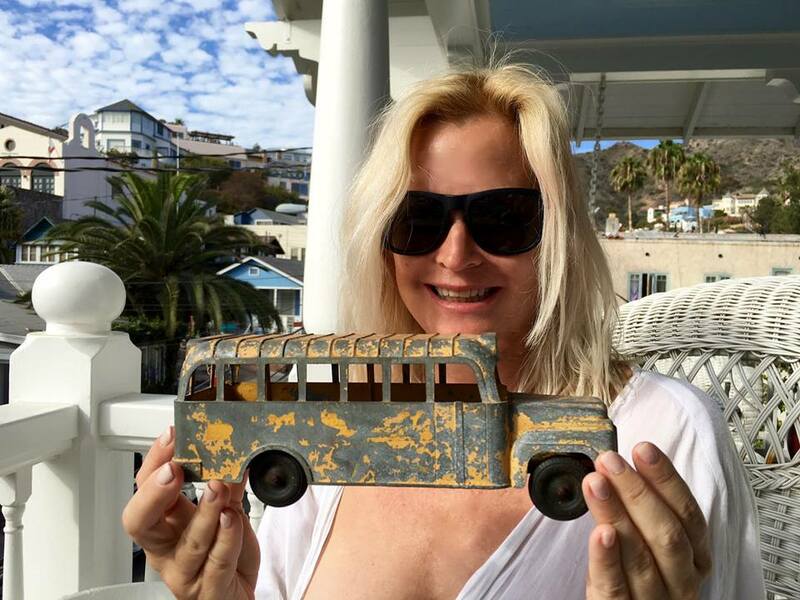 We both knew what that vintage toy school bus represented when she unwrapped it on Santa Catalina Island — it was the bus we both fell for at first sight, the one we didn’t want to leave, the one we didn’t want to stop driving, the one we didn’t want to stop bouncing along inside. We will be on board it as we start the most epic adventure of our lives. We’re going to call that road-ripping, International diesel beast our home, and I couldn’t be happier. My goofy grin says it all. But that’s the beauty, isn’t it? The sense that everything lies before us. When we arrived on Catalina Island that Tuesday morning, we watched people board the ferry back to the mainland with long faces, realizing their journeys were over and that reality awaited them on Wednesday. There’s an unrivaled joy in anticipation, like a kid on Christmas Eve, when the mind and heart are one in the present and dreams can roll out before you like an endless road. Keep whispering in my heart, Kitty. I hear loud and clear.